Today’s edition of AS mentions Pep Guardiola’s side are not the only club from the Premier League following the 22-year-old, with them backing up that he’s on radar of Newcastle United and Crystal Palace. 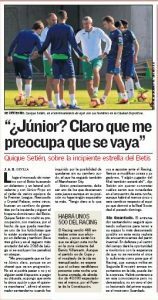 With the rumours of the English clubs chasing Junior, Betis manager Quique Setién was asked to give his thoughts about the reports linking his player with a move away from the club based in Seville. “I would worry about Junior, of course, because he is a kid who is progressing. I don’t know if it will happen or not. If someone is willing to pay his termination clause, I suppose it would be the only option…” the Spanish club’s boss said. The interest from Premier League clubs is not something new and we have covered several stories about the same, including one linking Junior to Arsenal. AS again mentions City are following him, but nowhere in the report they mention if either them, the Magpies or Roy Hodgson’s side are interested in signing Junior in January or if they’re ready to make a bid for the player anytime soon. In August, the left-back committed his future to the La Liga outfit by signing a new deal that will keep him at Estadio Benito Villamarín until 2023, with a release clause of €50m.